UW-Milwaukee Math Department Chair Bruce Wade, Math faculty member Allen Bell, the Math Departments University Services Program Associate Kimberly Lacking-Quinn, and Atmospheric Sciences faculty member Clark Evans and Atmospheric Science Emeritus Professor Anastasios Tsonis were recognized for their accomplishments and works. 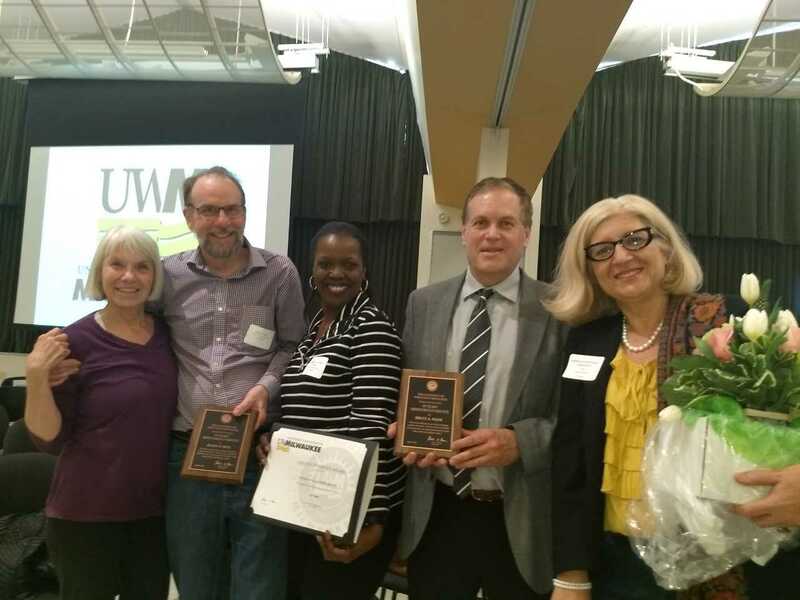 The Department of Mathematical Sciences had three members honored at the all UW-Milwaukee Service Awards Ceremony on Wednesday, April 24, 2018. Allen Bell, Associate Professor, was recognized for 30 years of service at UW-Milwaukee. Kimberly Lacking-Quinn, University Services Program Associate, was awarded for 10 years of service. Bruce Wade, Department Chair and Professor, was honored for 30 years of service. Clark Evans, Atmospheric Science Associate Chair, Coordinator and Professor, was interviewed about the Atmospheric Science program by Angela McManaman for the April 2018 edition of the In Focus Newsletter. “We’ve tweaked the requirements of this rebranded degree program to match employers’ expectations and so that students have the skills to succeed no matter what they choose to do post-graduation” says Evans. View the full article in the College of Letters and Science In Focus April 2018 Newsletter.